Houses of Worship often struggle to fund operations while maintaining focus on helping the communities they serve. RA POWER & LIGHT spends considerable time understanding client needs prior to developing the “right” project strategy. We begin using sophisticated software tools to model 15 minute interval usage data over 12 months to precisely quantify demand and to verify the highest and best use of PV onsite. Peak demand at HOW facilities differs from other commercial buildings in the sense that the high load typically occurs on weekends instead of weekdays. The lack of tax incentives for nonprofits places greater stress on the financial model, which requires a conservative system design, optimized for the specific load requirements of the facility. To earn the right to build best-in-class commercial solar systems, we perform a lot of no-cost, no-obligation energy consulting services on the front end. 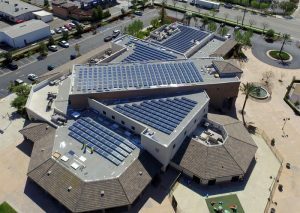 Once the proper design and approach are agreed upon, RA POWER & LIGHT zero down financing enables Houses of Worship to receive roughly half the Federal tax credit and own their system. Financing is secured by the system itself- not the facility. With zero down and payments below the worst-case value of the annual solar contribution, RA POWER & LIGHT finance solutions for HOW organizations are cash-flow positive from the start and remain so throughout the usable 25-year life of the system.